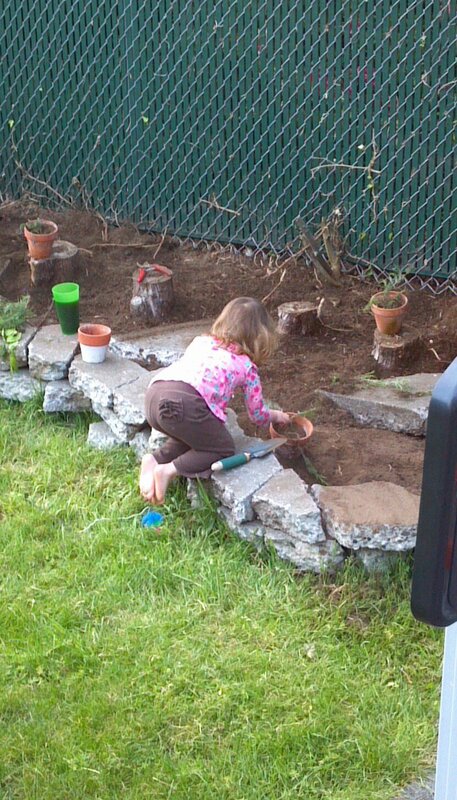 I'm still digging dirt out of Lorelei's fingernails after having her help me plant a bunch of veggies and herbs tonight. My neighbor Tracy has been kind enough to let me spill into her yard and share her newly-forged garden bed. Recovered and well gnawed on popsicle sticks. 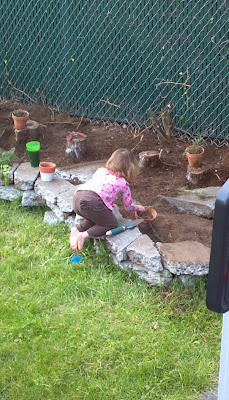 Lorelei helped get it up and running. Anyhoo, Here's what we have to look forward to in the coming weeks/months. Basil, two tomatoes, pumpkin starts in the red pots, and onions and carrots back there in the dirt. It's not the prettiest garden, but I'm pretty happy about what's coming up. To quote Lorelei, "Yum mama! This is gonna be goon and num num!"